A common question from companies interested in creating marketing plans or communications is, “How much will this cost?”. A common question from designers, agencies, web firms, printers and other providers is, “Do you have a budget?”. The reasons are obvious… organizations want to maximize the return and minimize the cost. Providers want to know if the way the project is being described is “realistic”. So cost is important to everyone involved. However, money is only one of four resources that I include in conversations about new marketing projects. Here are the other resources that are critical to success of a marketing plan or project: Money, Time, Expertise, and Energy. Money – As outlined above, everyone is concerned about the costs involved. That is partially due to the reality that costs for communications tools are perceived as “all over the board”. A website can be free or cost $50,000. That can be difficult to navigate. It’s also due to the finite dollars budgeted for Marketing. No organization has unlimited funds for marketing and they always want to do everything they can to get their message out. 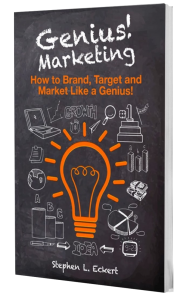 Learn more about marketing budgeting and more in the Genius! Marketing book! Time – Often overlooked as a marketing resource is time. Time is sometimes used as an alternate to money. Meaning companies think of ways to use their own time to reduce cost of a project. That is fine… if a company can supply time to a project whether in planning, or producing, it does reduce cost. However, we often think we have more time than we do. The other two resources are related to the time available. Expertise – Associated with time is the expertise of people. Many organizations have talented people who are interested in helping with marketing. They want to be involved. That is great! One of the planning steps for a project in the Genius Marketing process is putting together a roster of people who are involved in marketing (they aren’t always from the Marketing Department – if there is one) who have the expertise (and time) to help build the plan, create the communications and manage the implementation. This expertise within a company is critical for building the processes that sustain a communications campaign. Getting multiple people involved, using their gifts and interests to help promote the company can save external dollars paid for marketing expertise. It also helps build the fourth critical resource. Energy – I sometimes call it “will”. It’s the capacity of an organization to get marketing done. It’s great to consider internally the time and expertise we can commit to marketing, however, if we don’t have the energy, it’s better to consider buying services. Getting people involved can build energy. However, other factors in a company reduce energy. For instance, if marketing tasks are added to already overwhelmed people’s work load… energy will be low. Or, if an office move, new structure or other major change is in the works, people won’t have the energy to focus on marketing. They may want to be involved, but the other initiatives will reduce their will (or energy) on the marketing efforts. So, it’s not just about the money. All of the four elements must be considered as part of the resources a company brings to a marketing initiative. That’s why Genius Marketing helps companies build a plan that merges both available internal and external resources. It can help reduce cost, but a thorough plan of how all these resources are included make the success rate of projects go up. A good plan and mapping of processes results in the right mix of internal and external resources resulting in a “budget” for more than just financial considerations. If you’d like to discuss how to develop a great project or campaign plan, contact us to start a discussion. We’d love to spend the time with you.